A new projector - joy and pride in your home. We've all been there, there's something that most people do - and even I did it. Investing in a projector that's not worth its value? No, that's not it. There's something else that really a few people pay attention to. Still can't guess? It's a projector screen. People pay attention to the space necessary to make the projection, but don't give the screen a second thought. What I did was I believed that projecting on a wall will be perfectly fine. It's a projector after all, right? Well, no. It was only once I realized the difference between a projector screen and any other surface. Therefore, in this post, I'm using my past experience to raise the importance of a projector screen, and tell you the benefits of a pull down projector screen. You'll also find top 4 pull down projectors I've categorized in a few different ways, so I match it to everyone's needs. If you're in a need of a quality projector screen - stay tuned and by the end of this article, you're most likely have your winning choice! If you're in doubt if you should spend just a little bit more to invest in a quality pull down projector screen, these 4 projector screens won't only give you a clear answer but will also let you know a few good reasons why you should upgrade your current projection surface and why the decision will be worth it! FEZIBO is the best choice when it comes down to the pull down projector screens. Not only because of its decent size, which still makes it easy to be attached to a wall or even used on a stand but because of its features and build quality. For the price it costs, it definitely improves the viewing experience, no matter how quality the projector is. Even though this is a manual version, there's also an electric version available where you can help yourself with a remote controller to pull down the screen. 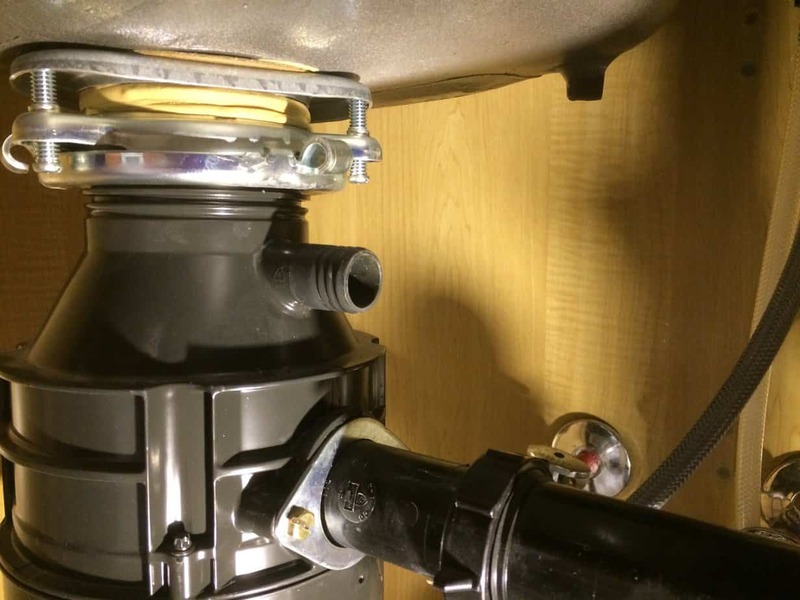 Might not be really necessary and most people could find it fancy, yet it's still a good thing to have - depending on your desired installation process. Even though the size of this pull down projector screen is 100 inches big, the quality of the material used is outstanding and there were no sacrifices made at all. FEZIBO projector screen is made from PVC fabric that is very durable,hard to tear, easy to clean, and supposedly is anti-crease. However, there might be a bit of crease that takes time to get flattened out. Or at least, that has happened in my case since I let it sit in a box for a while after unboxing it because I didn't use it straight away. The back of the material is black which is built in a way to let no light through the screen material. This will prevent the image quality loss and the colors range will stay as good as the projector color range is. Even though the screen of this pull down projector screen is huge, you can still sit anywhere at large gatherings since the viewing angle is about 160 degrees. 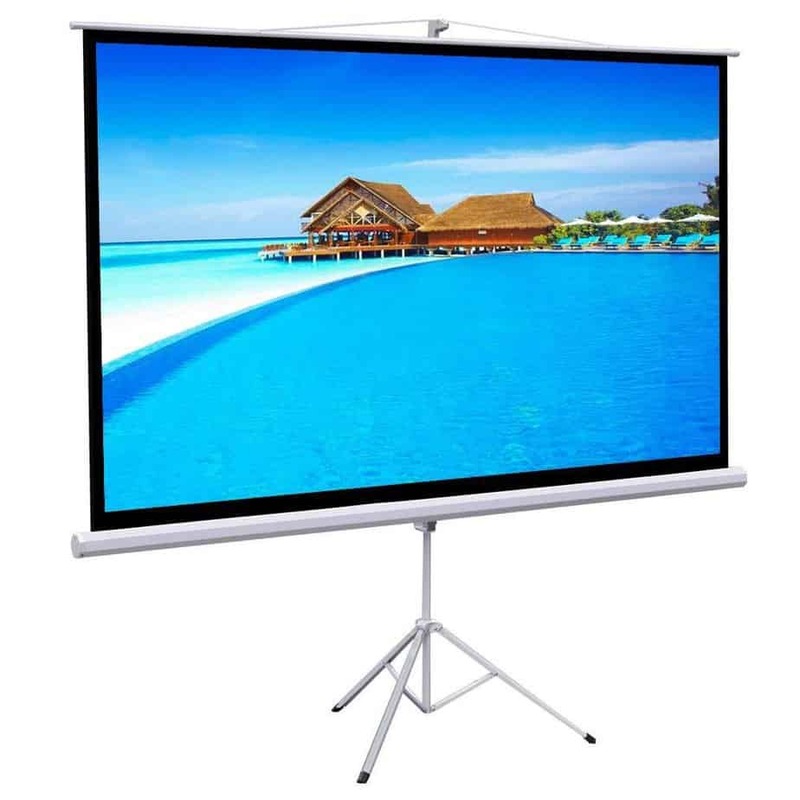 What we found to be even more useful is the ability to use this projector screen for both indoors and outdoors purpose. 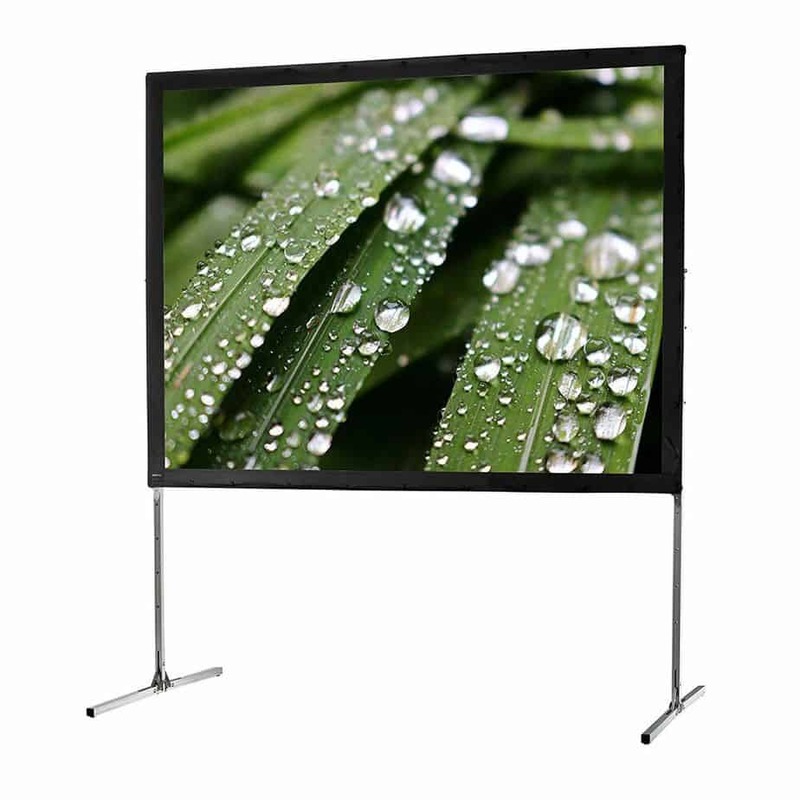 The viewing angle really excels when this projector screen is used for an outdoor purpose. You can gather as many friends and family you can and yet everyone will have a great viewing experience. It only takes one person to assemble the FEZIBO pull down projector screen and what's really great is that no tools are required. However, we've found the installation to be a lot quicker with two people or more. We've really liked the durable metal casingthat can be installed on a wall or ceiling. You even get an iron stand suitable for the projector screen in case you don't feel like drilling the holes in a wall. If you're someone like us, someone who goes only for the quality and doesn't pay attention to anything other than the top-notch quality product, this might be a perfect choice. Gotobuy is a large pull down projector screen that is built using quality materials and is made to last for long. With a number of specifications and features, it provides excellent viewing experience at very decent screen size. What's really great about this quality pull down projector screen is that it's very universal and is suitable for different types of projectors. It's also suitable for both indoor and outdoor use, and no matter how many people are watching - nobody will miss a single thing. Not only because of the large size but the image quality and the viewing angle. This projector screen supports 4K Ultra HD and 3D projections thanks to its flat & quality, anti-wrinkle surface material. After we've installed this projector, no matter where we sat, we've always got the ultimate viewing experience since this pull-down projector screen has a 130-degrees viewing angle. You don't have to always sit right in front of the screen, which is ideal for family or friend gatherings, especially if you install the projector screen outside. If you're always gathering family or friends, this might be the key feature that will really be worth purchasing the Gotobuy 100" projector screen. The floor-standing tripod that comes included with this projector screen is made with the help of the latest modern manufacturing process that saves space, is lightweight, and can easily be transported due to its foldable feature. We've found the standing tripod to be very durable since it's made of quality iron material, however, it might not do well on an uneven surface. The height of the tripod legs isn't adjustable which would have helped to even the stand when it's placed on the uneven surface. While this might not be crucial for the indoors, it's very significant for outdoor use. But it's fairly easy to find a spot and make sure the surface is even when you're planning a movie night outdoors so that's not a big concern. If you're looking to get the most out of the projector screen for the money you pay for, Celexon is a good choice. It features a great screen size of 134 inches, can adjust to different aspect ratios, is easy to install and isn't pricey at all. We understand that projectors can be quite expensive, yet the quality screen isn't, but it's a great addition to add to boost your viewing experience. Celexon features a fabric that is made out of 3 layers which include 2 different types of PVC and one type of plastic material combined together. 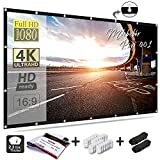 Such combination ensures great viewing experience since the projected image will never lose its quality due to the image bleeding through the fabric, reflection, or any other reason. What we like is how simple it is to flatten out the fabric and the ability to install it within minutesof unboxing the product. On the downside, the fabric comes with a bit of a chemical smell, but it airs out itself pretty quickly. No matter the way you install this pull-down projector screen, you can always adjust the height, even if the screen is attached to the ceiling. You can pull down the screen and stop at different heights, meaning you can also adjust the screen to the wanted aspect ratio. However, keep in mind that once you attach and install the casing of the screen, the overall height might not be very adjustable after all. With the number of ways to install the Celexon 134" projector screen, what's also great is the multi-use ability. It's suitable for a great movie night offering a cinema-like quality screen while it can also be used in the morning for your office presentation. Considering the price, it offers a great value that won't only last for long but will provide a great viewing experience no matter the use. Even though we haven't tried using this screen outdoors, we find it to be quality enough to be used for such purpose. 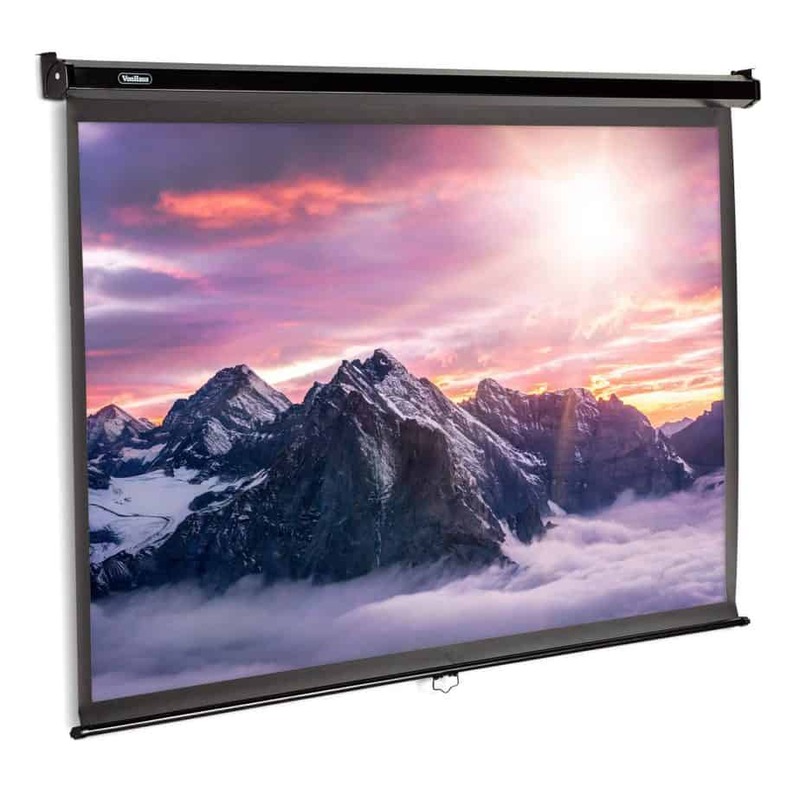 Being on a budget might restrict you from getting the best of the best, but VonHaus will give you a perfect pull down projector screen that is 80 inches big and is made with quality fabrics that provide an enhanced visual experience. The image will be as good as your projector is, and then even a bit better. 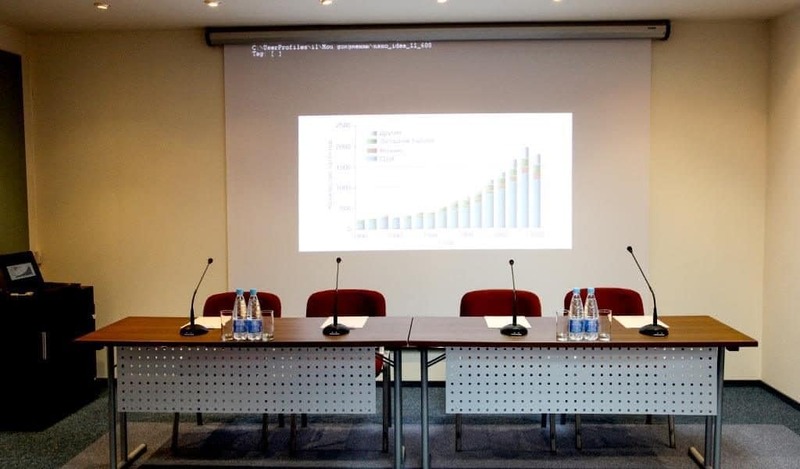 Since the image is always better on a projector screen than on a wall or other types of surface. Whether you decide to use the VonHaus projector screen in the office or at home, you'll have a few different ways to install it. You can either mount it to wall, ceiling or even additionally purchase a tripod stand that will fit this pull-down projector screen. It's up to you to find the best fit for your needs, as this projector screen can be used for anything from creating a cinema experience at home to an ultimate gaming experience- which we've tried, and the experience was is amazing with such large screen. But you shouldn't misunderstand the quality of the VonHaus projector screen since it's definitely worth every dollar it costs. No matter where you install this large yet easy-to-install screen, you will always get a great viewing size and angle. The size of the VonHaus projector screen is approximately 39" x 70" x 80" which will make sure everyone has a great view on the screen, no matter where they sit. You can gather up as many friends and family as believe us, no one will have time to even think about the cons since they'll be too busy enjoying the amazing experience. What we really like about this projector screen size is that it has a 1.1 gain rating for low light reflection. This means that the matte screen fabric that comes with black edging improve a contrast ratio and ensure a better viewing experience. That's just one of many reasons why you should get a projector screen since the wall or any other type of surface won't do as good as the screen would. Even if you're on a budget - VonHaus proves that you can still find a quality pull down projector screen. Pull down projector screens are one of the easiest yet the best options you have when looking for a quality projector screen. With so many options available on the market, it can be quite hard to find a quality screen yet still get a great deal. The price & quality range is huge and this buying guide will help you focus on the most important aspects of every pull-down projector screen so you exactly know what to look for, in order to get a quality deal for the price you pay, of course. One of the most important factors of every projector screen is definitely the fabric used to produce the screen. 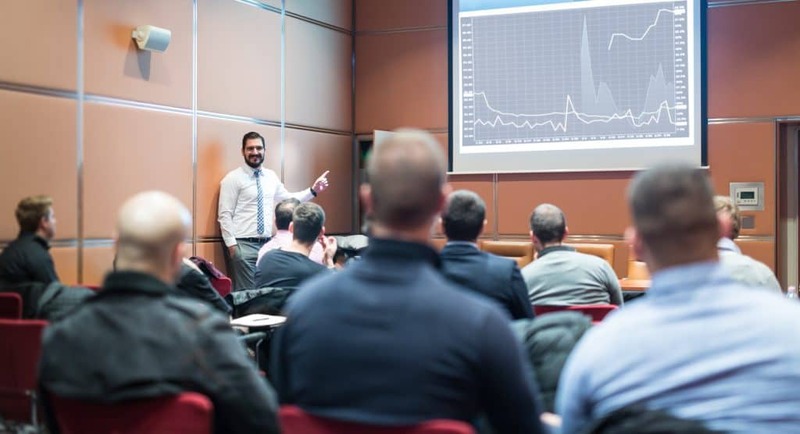 It's an aspect that can either make or break a projector screen, and it's very important to know which materials are quality and what else improves the quality of the viewing experience. The most common fabrics used are either polyester or a combination of PVC and polyester. They're very good at preserving the light and preventing it from going through the fabric since they come with a number of specific coatings. Therefore, they offer a great viewing experience. The good thing about most pull down projector screens is that they're very adjustable when it comes to height and the ways of installation. Most pull down projectors can be installed on a wall or ceiling, and some of them even come with a suitable tripod stand. What we also like is the ability to adjust the screen height and aspect ratio with a simple option to use only part of the screen. For example, with a 130" pull down projector screen, you can use 90", 120" or 130" of the screen. While some of the projector screens come with only one aspect ratio available, other screens have the ability to offer two or even three aspect ratios. They do it by an additional layer of black fabric on top of the screen that creates a perfect aspect ratio to match the projector's aspect ratio. This can give a cinema-like viewing experience and if your screen happens to have a wide viewing angle - you will be able to actually experience the cinema screen experience to the fullest. The wider the viewing angle, the more freedom you have - meaning, you don't have to sit straight in front of the projector screen. That's ideal for larger groups, or when you bring your friends or gather your family around. Even though projector screens might seem like a simple purchase, when you're looking to get the best there is for the price you pay and score the best deal possible, it's important to pay attention to even the smallest things to find the most suitable projector screen for your needs. And in case you have any questions, these answers below on some of the most common questions related to projector screens will help you out. Q: What if pull down projector screen won't stay down? A: If a projector screen won't stay down in a position after you've pulled it down, it's most likely that the mechanism isn't working properly. In the best case scenario, you might get it fixed, but in the worst case scenario - it'll need replacement. If it's a brand new pull down projector screen, you should definitely have it replaced to avoid any failure in the future. Q: Can you make a DIY pull down projector screen? 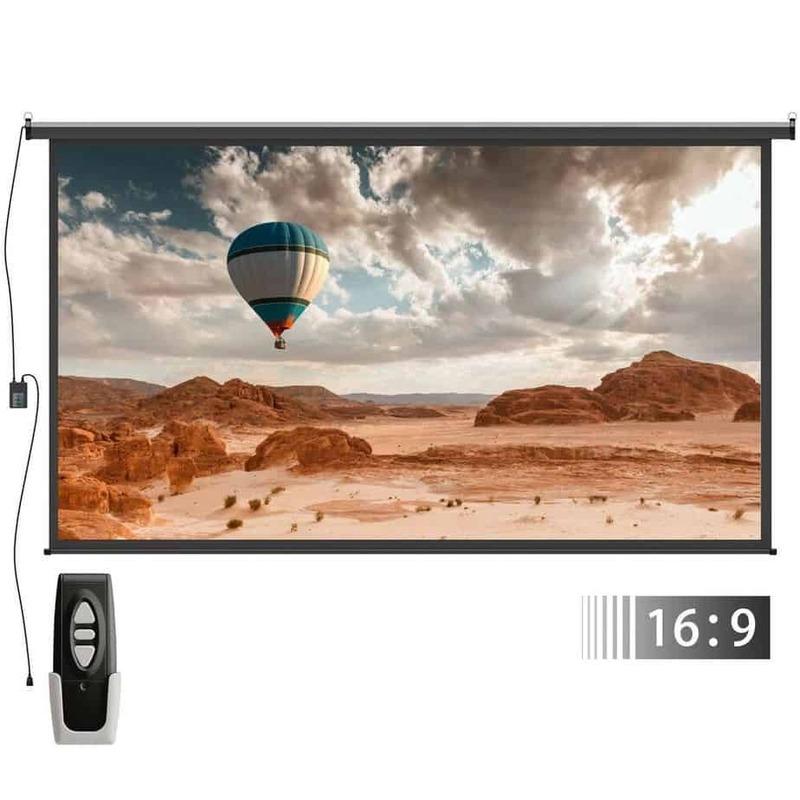 A: While there are many ways for a DIY pull down projector screen, some of them even being under $10, the quality can't be compared to the quality of pull down projector screen. It's definitely possible to make a hand-made projector screen, but if you're looking for quality, a DIY pull down projector screen might cost you almost as much as the new one is. Q: How is a projector screen made? A: The material used to make a projector screen is definitely not a simple cloth you can get anywhere and use it as a screen. Screen fabrics are coated with a number of coatings such as magnesium carbonate, titanium dioxide, and even barium sulfate. These coatings ensure the enhanced visibility of the light, light reflection from the surface, and many more aspects. Q: Pull down projector screen VS fixed projector screen? A: While both options feature very quality screens that are specifically made for image projections, it's up to you to determine the use and style of your screen. Would you like to install it once in your basement and then forget about it or you'd like the benefits of versatility and portability? In our opinion, pull down projectors are a great choice because of the versatility and multiple ways of installation. Q: Difference between manual and automatic pull down projector screen? A: If you were searching for a pull down projector screen before, it's most likely you've come across an automatic pull down option. The only difference between the two is in the pull-down system, and it doesn't affect the quality of the screen. If you have some extra money, going for an automatic pull down projector screen will give you the luxury of pulling the screen down with a press of a button from your sofa. Q: Does pull down projector screen requires a tripod stand? A: Even though it's quite common for pull down projector screen to come with a suitable tripod stand, it's not necessary to have one, in case you don't get it included. What's great about pull down projector screen is the ability to install it on a wall or attach it to a ceiling. But we find that the tripod stand is very useful if you're looking to get the most versatility you can from the screen. With technology advancement, there are some really great projectors that offer a high-quality image which can even produce a cinema-like experience. 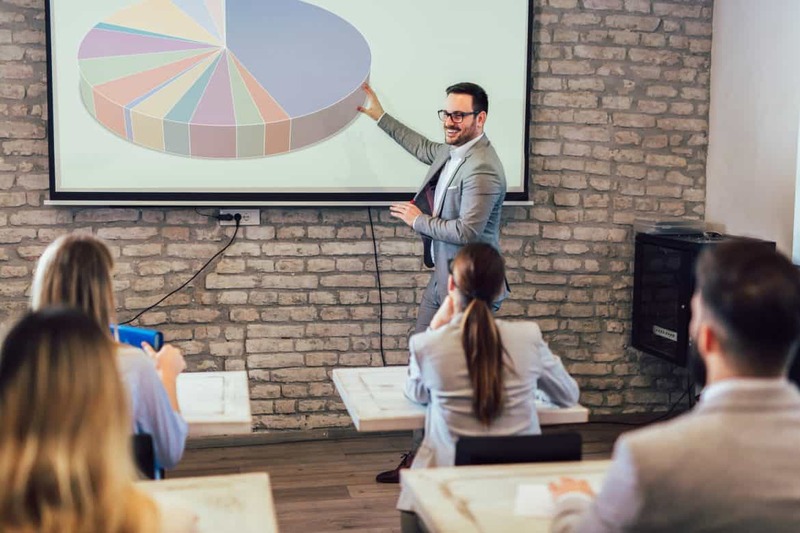 If you're all about the quality, investing in a high-quality projector screen that will match the quality of your projector and offer an enhanced visual experience is a smart choice to make. No matter which pull-down projector screen you go for, these 4 projector screens are one of the best on the market yet empty your pocket. All you have to do is choose the desired size and pick one of the screens reviewed in this post to improve your viewing experience. Quora - What are projector screens made of?